Welcome to the Riehl Lab! We study the ecology and evolution of avian behavior, especially cooperative behavior and mating systems. How do natural selection, phylogeny, and ecology interact to shape the diversity of social systems that we see in birds today? How do individual decisions affect group-level behaviors? How do the challenges of social life affect selection on cognition, recognition, and learning? And how do cooperative groups protect themselves against parasites and cheaters? We use a combination of field and molecular work to answer these questions, with field sites in Panama, Colombia, Argentina, and the U.S. This nest contains the eggs of three female greater anis, who are unrelated to each other, can't recognize their eggs or offspring, and share parental care of the mixed clutch. How do complex cooperative interactions like these evolve between genetically unrelated individuals? Brood parasitism is common in birds, both within and across species. Neotropical striped cuckoos (above) are obligate brood parasites, like their European cousins -- but both parasitism and egg mimicry have evolved independently in the two lineages of cuckoos. Why is brood parasitism so common in cuckoos, but so rare in other birds? 2/27/19: Christie and Meghan's new paper on the fitness payoffs of cooperative nesting vs. brood parasitism in anis is published in Nature (here). Many thanks to Andy Zink and John Eadie for contributing a lovely "News and Views" piece on the paper (here). You can also read Christie's "Behind the Paper" blog post here, and check out some media coverage (Science News here, Princeton press release here, Nature podcast here). 2/11/19: Will Feeney and I have a new paper out on the evolution of mating systems of obligate brood parasites in a theme issue of Philosophical Transactions B. Read about the paradox of social monogamy in brood parasites here. Thanks to Steve Portugal, Rose Thorogood, and Claire Spottiswoode for inviting us to contribute to this fascinating theme issue on brood parasitism! 1/1/19: Welcome to new postdoc Josh LaPergola, who will be studying group decision-making in anis! 9/19/18: A new review paper is out in Proceedings B on the concept of "tipping points" in animal societies and how behavioral ecologists might define and use tipping points in the study of the evolution of cooperation (here). Thanks to Jonathan Pruitt and the Santa Fe Institute for leading this collaborative effort! 7/6/18: A new collaborative paper with Melissa Mark, Mark Hauber, and others is out in the Journal of Chemical Ecology, on the eggshell chemistry of Striped Cuckoo eggs and the Rufous-and-white Wren eggs that they mimic! Not only that, it made the cover! Check it out here. 7/1/18: Farewell and congrats to Dan Baldassarre, who is starting as an assistant professor at SUNY Oswego! We'll miss you, Dan! 6/19/18: A new collaborative paper with Dan, Christie, and others is published in Journal of Avian Biology, on the chemistry of ani egg coloration and how anis perceive it (here). Thanks to Mark Hauber for spearheading this project! 6/15/18: Congratulations to graduating seniors Ellie McNulty, Mitchel Charles, and Emma Latham (recipient of the department's Book Prize for best thesis in Agriculture!). Stay in touch! 6/1/18: We're excited to start work this year on a new project on collective decision-making in anis. Many, many thanks to NSF! 6/1/18: More congratulations to Amanda, on receiving a Lewis and Clark grant for this summer's field work! 5/24/18: Many thanks to the Princeton Environmental Institute, for funding an internship for undergraduate Oliver Whang to join us in the field this summer! 4/24/18: Congratulations to Amanda, who passed her Ph.D. qualifying exams with flying colors! 4/11/18: Christie and Meghan's paper on the fitness effects of social bonds in anis is the cover of Proceedings of the Royal Society of London, Series B! Check it out here. 11/8/17: New paper on reproductive skew in cooperatively breeding birds is out in the American Naturalist (here)! Check out the summary on the AmNat blog here. 10/4/17: Our paper on inter-group competition in anis is published in Animal Behaviour (here). 9/30/17: Christie is selected as a Kavli Fellow by the National Academy of Sciences. 9/4/17: The end of another field season. Thanks to ani field crew Christa Morris, Zach Smart, Luke Carabbia, and of course Meghan Strong and Amanda Savagian for making it such a success! The anis continued to rebound after the 2015 El Nino with lots of breeding activity; we started a new set of experiments on begging and chick-feeding rules; and we captured extra-group infanticide of nestlings on video for the first time! 6/6/17: Congratulations to graduating seniors Allison Conwell (recipient of a departmental award for outstanding academic performance on her senior oral exam) and Vivien Bazarko (graduating with honors)! Good luck and stay in touch! 5/8/17: A belated announcement that Cynthia's paper on the genetic mating systems of Baywings (the primary host of the specialist Screaming Cowbird) is out in the Auk (here), and Sarah Porter's undergraduate thesis work on the strange leaf-eating behavior of Crested Guans is out in the Wilson Journal of Ornithology (here). Congrats to Cynthia and Sarah! 5/1/17: Wow! Graduate students Amanda Savagian and incoming graduate student Maria Smith both won prestigious NSF Graduate Research Fellowships! Big kudos to Amanda and Maria! 2/7/17: Congratulations to post-doc Cynthia Ursino, who has won a Fulbright fellowship to come to the U.S. to conduct genetic research in the lab! Fall 2016: Post-doc Dan Baldassarre joins the lab to work on the bizarre breeding behaviors of phainopeplas, post-doc Cynthia Ursino joins the lab to work on brood-parasitic screaming cowbirds (co-advised by Juan Reboreda at the University of Buenos Aires), and Amanda Savagian starts her Ph.D. work on ani vocal communication. Welcome!! 6/29/16: Research paper on infanticide in communally nesting anis is published in Evolution. Check out the online early version here, and see the press coverage in Science here! 6/7/16: Traveled to Paris for a fantastic workshop on cheating and mutualisms, organized by Judie Bronstein, Maren Freisen, and Megan Frederickson. Thanks to the Ecole Normale Superieure for hosting and support! Check out the meeting website here. 5/30/16: Congratulations to graduating seniors Haley Gordon and Sarah Porter! Bon voyage! 5/9/16: Thanks to the Princeton Environmental Institute for funding our Grand Challenges grant! We'll be looking at the effects that the ongoing El Nino is having on drought, insect abundance, and birds in Panama. 3/12/16: Congrats to Princeton freshman Zach Smart, who was awarded a PEI internship to join the field crew in Panama as a research assistant this summer! 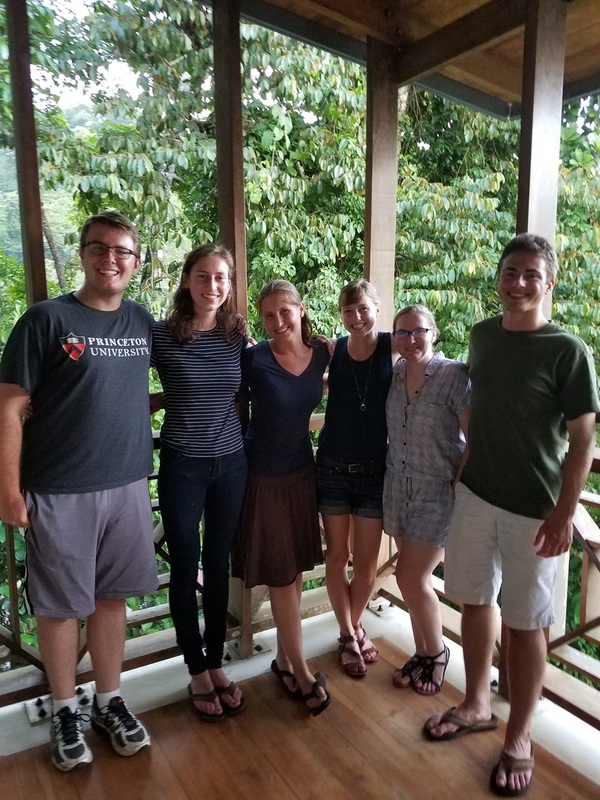 3/1/16: Princeton juniors Allison Conwell and Vivien Bazarko will be joining the lab as senior thesis students -- Allison to study post-fledging care in Florida Scrub-Jays, and Vivien to study facultatively social bees in Panama. Welcome! 2/6/16: Theme issue of Phil Trans B, "The evolution of cooperation based on direct fitness benefits," is online, co-edited by Michael Taborsky, Joachim Frommen, and Christie Riehl! Check it out here. 2/6/16: Review of cheating and punishment behaviors in social animal societies is published in Phil Trans B, co-authored by Christie Riehl and Megan Frederickson. Check it out here. 12/1/15: Commentary on kin recognition in cooperative birds is published in BioEssays, co-authored by Christie Riehl and Caitlin Stern. Check it out here.